Light Green 1.75mm PLA Filament 1Kg. Spool size same as Makerbot. Diameter 200mm, Inner Diameter 50mm, Height 75mm. Items ship within 24 hours M-F.
All Items ship US Priority 2-3 day Mail. Our 100% USA made 3D printer filament is simply the highest quality filament you can get for your 3D printer. Save yourself the headaches and cost of dealing with low quality imported filament. 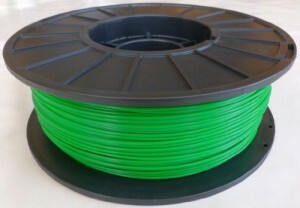 Onlinefilament has been selling quality PLA and ABS filament since 2011 with vibrant ABS and PLA colors available in 1.75mm and 3mm. Our filament is always round with no oily residue no air bubbles and it comes loaded on a quality spool. Unlike most imported filament that’s translucent in color our filament is 100% opaque. For more information on filament quality visit Onlinefilament. All items ship within 24 hours M-F.
All items ship USPS Priority 2-3 day mail.